W. J. Isaac Purvis, Joyce B. Gardiner, Omni Sorel, Angus M.
Departing the MacArthur Lock during the tugboat parade, July 1, 2010. The tug W. J. Isaac Purvis (C318726) was built by the McNamara Construction Company at Whitby, ON., in 1962. It was christened Angus M. and measured 72 feet long by 19 feet wide by 12 feet deep. The 71 gross, 34 net ton tug was powered by a Cummins engine of 450 brake horsepower. The ship was sold to Alexander Hume in 1988 but was laid up at Whitby until towed to Toronto by the tug Soulanges in November 1988. It was sold to Sorel Tugs Ltd., and renamed Omni Sorel in 1992 but never used by them. It was resold to McAllister Towing in 1994, towed to Montreal and then joined Three Rivers Boatman for service on the St. Lawrence around Sorel, Montreal and Quebec City. It became part of Groupe Ocean in 2002 and then was resold to Alexander Gardiner, also in 2002, for use under North Channel Diving & Marine as Joyce B. Gardiner. It was upbound in the Seaway for Sault Ste. Marie on June 12, 2002. 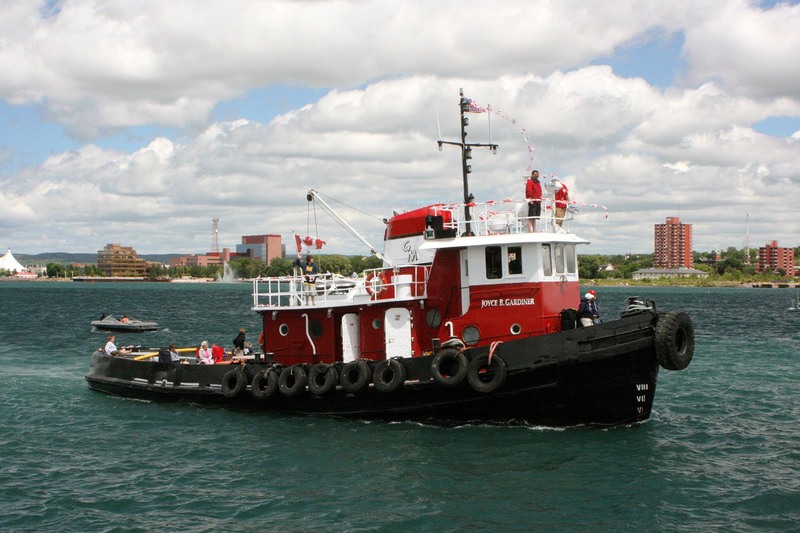 The tug was purchased by Purvis Marine Ltd. and renamed W. J. Isaac Purvis in 2009. Getting new colors at the Purvis dock, July 29, 2009.